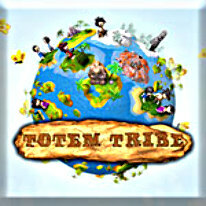 Welcome to the magical world of Totem Tribe, where you must help Aruku guide her Wolf Tribe to peace and prosperity by finding the 6 powerful animal totems and returning them to the Cradle of the North. Encounter both friend and foe along the way as you journey through an enchanted archipelago. Advance your tribes’ technology to aid in your quest - and your battle against the mysterious and malevolent shade that blights the once peaceful islands. Can you lead the Totem Tribe to glory?